LiveFX enables you to play all music in your iTunes music library. Unfortunately, we aren’t allowed to access music made available by third parties, like Pandora and Spotify. Where can I find my own music? Open the input dialog by tapping the button in the top left corner of the app, next to the LIVE FX logo. Select ’Music’ as your input source. You can browse your own music by sliding the bar at the bottom of the dialog. This way you can select to browse by artist, album, genre etc. You can only play your own music if you unlocked the full version. Unfortunately, we aren’t allowed to access music made available by third parties, like Pandora and Spotify. Why can’t I play DRM protected music or music that is in iCloud? A DRM-protected track can only be played by software that is allowed to play it. Playing a track using iTunes in the Cloud or iTunes Match requires downloading it from the Cloud. Up to now, tracks stored in the Cloud cannot be accessed by developers to provide something more than regular playback. 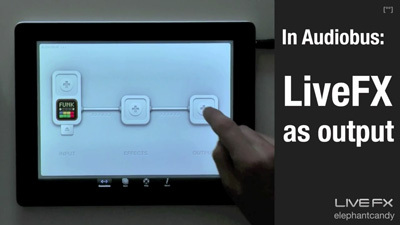 LiveFX has an input level as well as an output level. You won’t hear anything if either of these are set very low. You can monitor and adjust these levels in the lower left corner of the app (under the IN and OUT buttons). Do also check your iPad volume. I do hear my music, but I don’t hear any effects. Why? You can adjust the FX Depth, otherwise known as wetness, of all effects currently applied. Find it in the lower left corner of the app (under the FX button) and make sure it is not set to 0%. Why doesn’t LiveFX run on iOS 5? As you can read on our website, Elephantcandy is all about music and sound. We focus on developing cutting-edge algorithms, not on supporting many operating systems. Early on in the development of LiveFX, our tests showed LiveFX works best on iOS 6. Most music apps are heavy apps. 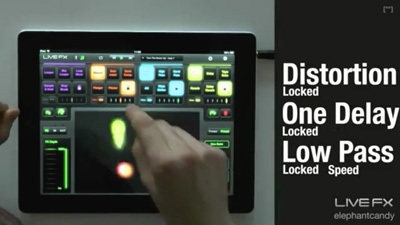 In order to give you the best synthesizer, the highest quality sound effect or the nicest looking recording app, your iPad is sometimes pushed to the limits. Before Audiobus, music apps were used as stand-alone apps; there was no use running two or more music apps. 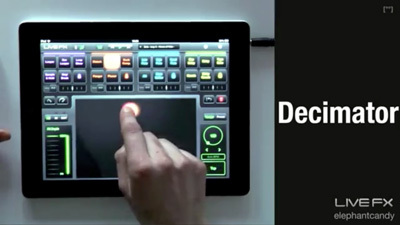 Now, with Audiobus, multiple music apps need to run simultaneously. Some of the Audiobus-enabled apps will require a small amount of processing power, others almost all of it. This sometimes makes it hard for your iPad to run all music apps smoothly, which can result in stuttering audio. Do mind that some apps, even when not connected in Audiobus, can still be using processing power in the background. We noticed that particularly the more elaborate synthesizer apps can absorb a lot of processing power while in the background. To keep Audiobus and its associated apps run smoothly, make sure to terminate a music app after you remove it from the Audiobus chain. Double-tap the home button, press and hold an app until the remove-icon appears, and tap it to terminate the app. If you have any comments, requests or bugs to report regarding LiveFX, please contact us.